Holiday Cookbook Contest: Send us your recipes! Did your grandmother make the best turkey stuffing? Was it your aunt’s minced pies that had you drooling at the Christmas table? In honor of the upcoming holiday season, we’re bringing together two great traditions – food and family – for an exciting holiday competition! We want you to send us your family’s favorite holiday recipes and the stories behind them. Is it a dish passed down from an ancestor, or one made last year for the first time? A unique dish to your family or a traditional one? Why do you love that recipe and what’s the story behind it? One lucky winner – with the best recipe and family story – will have the chance to have a personal chef prepare a delicious meal for you and your family at your home. We’ll collect a selection of our favorite submitted family recipes and prepare a special international holiday cookbook with recipes and stories from around the globe. Food has long been a family affair, and the holidays are a perfect time to taste recipes passed down through the generations or the countries our ancestors are from. The MyHeritage Holiday Cookbook will be available for download on our blog in the coming weeks. Christmas, Chanuka, Kwanzaa and Diwali are just a few of the global festivities celebrated by families around the world and each has its own special dishes. Regardless of whether it is a cousin’s secret recipe, or a modern take on a traditional holiday dish, each recipe tells us about your individual family history and background. We want to hear yours. Remember to tell us about your recipe (who made it, when, why it is special). Send photos of the holiday dish, a holiday family photo or even a photo of the relative whose recipe it is. 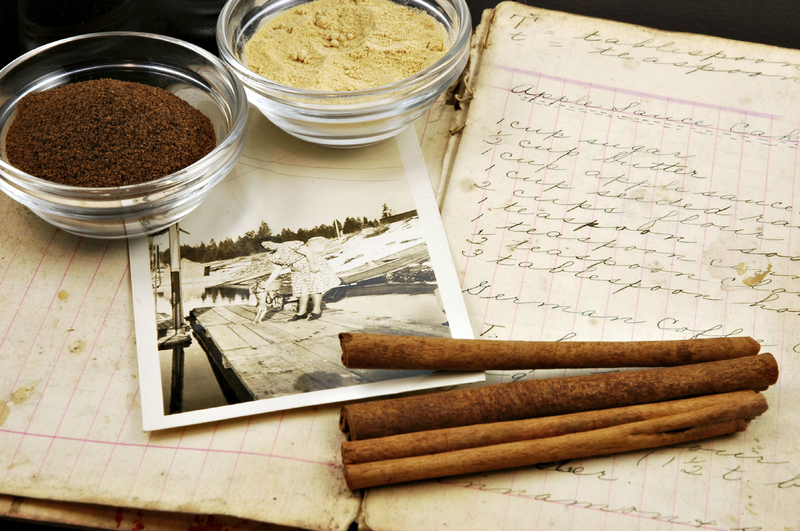 Share memories and stories about your family, the holidays and the relative behind the recipe. The holidays are a perfect time for the family to get together, share stories and memories, and enjoy a delicious meal. What better way to bring food and family together than winning a gourmet meal prepared by a personal chef right in your own home? Stay tuned to our blog in the coming weeks where we’ll post the full cookbook with many international festive foods for the holidays. We look forward to seeing your recipes and learning the stories behind them. Two small packages red jello. Water as called for. One quart vanilla ice cream,slightly soft. Make jello according to box. Stir in ice cream until well combined. Pour into 9×13 inch glass dish. Refrigerate overnight. Cut ino small squares. Serves upto sixteen. Serve at dinner. I don’t have a recipe for the way I prepare the turkey steaks, but any half cook knows how to bread a steak. (Flour salt and pepper, egg and milk, then bread crumbs) I first made the turkey this way when I was trying to think of a way to save oven space. Bone the raw turkey the night before. Cut the breasts into 1/4 inch slices and refrigerate. Cut the remainder of the turkey into small strips and mix in about 1/3 bottle of your favorite Italian dressing and refrigerate overnight. Next morning heat a large skillet and lightly brown the marinated strips. Add these to a slow cooker, stir every hour or so until time to eat. Get the steaks out about two jhours before eating time and assemble your breading ingredients and three grandchildren for the messy task . Show them how to bread the steaks and let them set a few minutes. About an hour prior to chow time cook the steaks in vegetable oil, place in pan when done and keep in warm oven until serving time. My kids and grandkids liked this so much they requested it the following year. Don’t loke the idea of the marinated strips… One year I ground them up and turned them into meat balls. This is more prep time and they were not as popular with my family. This year we are going to my son’s house to start a new tradition. Dad is going to take it eassssssy this year. Thanksgiving is not a good time to diet!